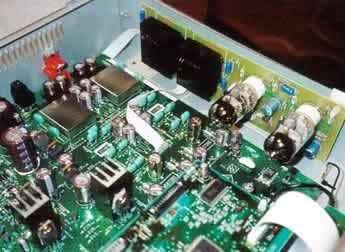 The CD6000 is a more interesting platform to modify than the CD4000. It already features decent power supplies, with Elna Silmic capacitors. Differential NPC 5872 DACs are used, which each have twin logic-level (5V/0V) PWM outputs. In the stock Marantz player, these outputs are filtered with NJM2114 opamps, and then buffered with the discrete HDAM opamp circuit. Not so here. 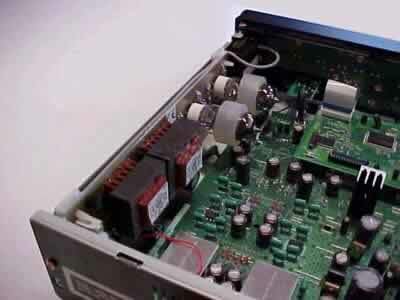 Heart disconnect the whole Marantz analogue signal path (but leave most of it in place), and substitute a pair of their own signal transformers - for differential-to-single-ended conversion and for filtering - followed by one Sovtek 6922 double triode per channel. Each channel's two triodes are used in parallel in a common-cathode amplifier with gain of 2 (not unlike the Audio Note DAC Kit 1.1). The output is 2.3V, sourced from a fair 1300 Ohms impedance. Biasing is with FET current sources. Additional HF filtering is done with the fine Philips polypropylene film-and-foil capacitors. It is, however, quite remarkable that the output coupling capacitors are ordinary industrial elcaps. The designer claims that these sound as good as expensive Elna Silmics in this particular application! Apart from this curiosity, this is a very purist and simple signal path. To power this, Heart fits two extra block transformers and regulated supplies: one for the high tension, one for the tubes' filaments. So the player has a total of three power transformers, and two signal transformers. One little drawback of all these coils, though, is that my CD6000 sample had an audible mechanical hum. Mind, not enough so to irritate during listening sessions, but still ... . I duly reported this to Heart, who themselves had just stumbled over the problem: it emerged that one of the power transformers magnetically induced vibrations into the player's housing. A piece of sticky tape cured all of this. Changing tubes is easy: all screws are standard types, as opposed to the esoteric Torx ones Marantz seem to like so much. Outwardly there is nothing that distinguishes the Heart from a stock Marantz CD6000: your pride of ownership will have to do with simply knowing that those glass bottles are hidden inside, singing for you. 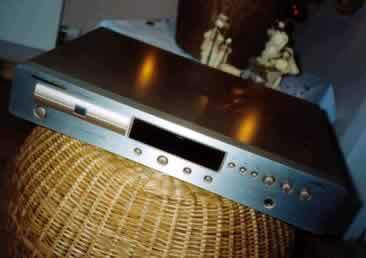 Luckily the CD6000 by itself is a well-built and nice-looking machine. My sample came in fetching champagne gold, and it matched the decor very well (but then we were around Christmas and New Year's Eve, so anything champagne did rather well). The Heart faces direct competition from the brand new Marantz CD6000 Ken Ishiwata Signature, a player that costs the same kind of money and that does sport a designer label. Since the CD63 of a few years ago, Marantz's budget CD-players (53,63,57,67,the SE, OSE, and KIS versions) have been sharing sonic commonalities that set them apart from the crowd. More bold than refined, the sounds they make are outgoing and enthusiastic, slightly exaggerated with a loudness-like contour, emphasizing the rhythm and drive of music; when used in a matched, similarly-priced system, that is. The latter really is important, as an overly transparent system tends to reveal the synthetic, electronic nature of the same sounds. Well, not quite so with the Heart! Oh, it retains the enthusiasm and fun of its siblings, but adds some genuine panache to the mix without having to fake things. What strikes immediately with this digital source is its glow, a warmth quite uncharacteristic for the CD format. Indeed, in tonal balance the Heart diverges somewhat from the norm. Probably intendedly so. And once you have adjusted to this, you just sit back and revel in some gloriously fluid sounds. The midrange is meaty, and the treble seems a bit reined in. Mind, these aspects do not patently stand out. Rather, the sound is consistent bottom to top, nothing standing out, nothing drawing undue attention. As the Rega Planet, the CD6000 is essentially grainless. This is a major feat for an affordable digital component. Speaking of the Planet. When I reviewed it eons ago for the Belgian magazine Audio Vision I found it dramatically more musical and 'true' than the Marantz CD67SE. At the time of its discontinuation a few months ago (there is an entirely new Planet 2000 now), the Rega cost about EU800, so a direct comparison of this old champ to the Heart CD6000 seems mandatory. On the busy and dynamic Dead Can Dance Toward the Within live recording the Planet sounded tranquil, with a nice treble, small, elegant, though a bit grey. The Heart brought more tonal colour, a goldish sheen (like its Veuve Clicquot Signature housing), more depth, and was at least as clean as its British competitor. With simpler music, Mary Black's acoustic Columbus the Planet fared well enough, though was somewhat shut-in and dark, whereas the CD6000 was fresher, with an audibly longer decay of cymbals. Overall it seemed to have more resolution and a bit more control in the bass. On the excellent John Gardiner recording of Monteverdi's Vespro della Beata Vergine the CD6000 yielded a 'louder' sound, with brassier brass, a slight trace of grain, but gorgeous decays of the huge San Marco acoustics. Not wasting more words on this: in comparison the Planet sounded confused. In fact, with these excellent results from the Heart CD, it emerged that the rather more expensive Hawk DAC was called for to properly gauge the Heart. Sure enough, this DAC was lighter, more quicksilvery, and brought welcome gains in low-level dynamics, rhythm, and detail. On the other hand, the Hawk had less projection, body, and colour: it sounded laidback compared to the CD6000's more forward positioning of voices and instruments, but with equal depth to the soundstage. While the Hawk was overall slightly more precise and tranquil than the sometimes-too-busy Heart CD6000, I must say that when it came to musicality both sources were in the same ballpark. I can imagine that some people, depending on system, taste, or software would prefer the bolder presentation of the Heart. As a matter of fact, in my own case it often boiled down to which player matched the particular music, or my mood: sometimes the microscopic scrutiny of the Hawk served better, but sometimes the less-transparent, bolder strokes of the CD6000 were more appreciated. However, do note that the CD6000 itself was used as transport for the DAC during these comparisons, and I do have the idea that the Planet does a slightly better job in this application. The CD6000 is available through a number of dealers in the Netherlands and Belgium, and of course through direct internet sales. As such, the chances of auditioning it prior to purchase are pretty slim for most of you. And yet, if you are a die-hard analogue fan with a need to play some CDs without breaking the bank, in a system tailored for a big turntable, then I think you won't be disappointed by this valved CD-player. Likewise, if you are a music lover on a budget, with a nice mid-end system, and in search of overall musicality and listenability, then I'd also recommend the Heart. It really makes CD listening fun. Not entirely hiding its Marantz origins, this CD6000 marries an upfront and lively quality to a beguilingly warm tonality. It handsomely trashed the Rega Planet, and rivaled the more expensive Hawk DAC. I have to admit it was not without heartache that I returned the CD6000 to the Stoetguys.